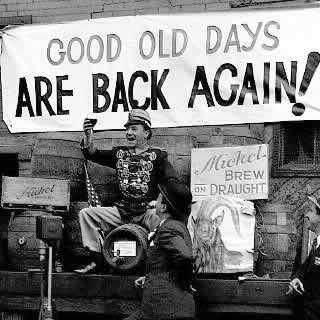 Remember: December 5th is Repeal Day! That’s right, folks: it’s that time of the year again. December 5th is Repeal Day! Hoist a drink at 21:00 to celebrate the 21st amendment, which repealed the 18th and allowed the fine citizens (and everyone else whose 21 years or older) to legally drink again. What, is there a “prohibition” on new blog posts? Come on. It’s the holiday season and your readers need you. I’m looking for the Oatmeal Cookie cocktail recipe and can’t find it. Did I just imagine you had posted it? At present I am making actual oatmeal cookies and looking for a cocktail that tastes the way the house smells right now. Help me, Ardenstone. You’re my only — oh, whatever. © 2019 ardenstone. All rights reserved.